Looking ahead, Co/Outsourcing remains a hot button trend in Database Administration and it is one that we expect to see continue for the foreseeable future. Clients have clearly recognized the benefits of this, as we are still noticing strong uptake in this model. There is little doubt then that Co/Outsourcing is working, and working well. With this in mind, we will continue to deliver more of the same in this regard – skills, expertise and the best SLA’s – as we focus on using what is a proven formula to add even more value to both our existing and prospective clients over the course of the year. Ascent is also looking forward to building on its existing key vendor relationships, such as the one we have with Microsoft. This relationship grew from strength to strength last year, highlighted by Ascent being presented with the 2011 Data Platform Partner of the Year Award at the Microsoft Partner Network Awards. This is a culmination of the ongoing efforts by both Microsoft and ourselves to continually grow and strengthen our association, and we believe that in 2012 we will raise the bar even further in this ongoing relationship. You can also expect us to continue to focus on ensuring we find the right products that will offer you strategic value in the Enterprise Data Management space. Testament to this ongoing strategy is the fact that in the past year, we have already brought on board Embarcadero in the Database Development, Administration and Optimization arena and both McAfee and IBM InfoSphere Guardium in the Database Security and Compliance space. As we move into 2012, you can expect us to explore additional avenues as we seek products that will offer further value to our client base. We are well aware of our clients’ need for continuity in skills and expertise, which is why Ascent places a high value on the acquisition and retention of the right calibre of people into the organisation. We understand that there is an ongoing skills shortage, so one of our key focuses for this year will be to place additional emphasis on obtaining and retaining the best people. The current skills shortage is even more acute elsewhere in Africa. As our business paradigm is based on services, this has opened up new opportunities for Ascent in the sub-Saharan region and led to us exploring new markets. However, while we are investigating a number of opportunities in the region, these will all be within the scope of our expertise. Wherever we operate in Africa, we will continue to focus on doing what we do best. 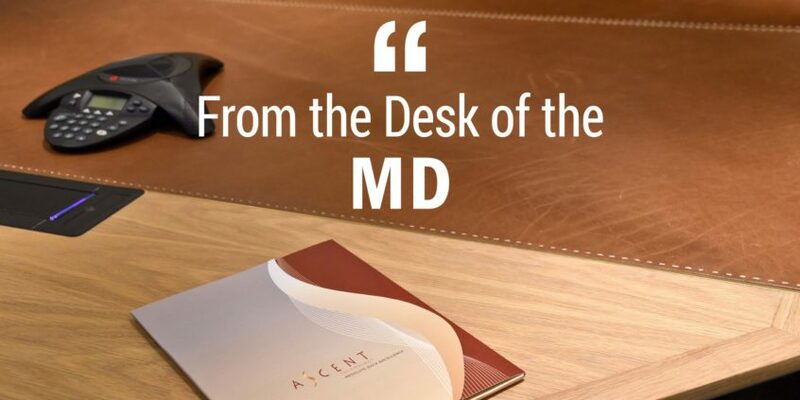 As this is Ascent’s ninth year in business, we would like to take this opportunity to thank all of our clients who have played a role in what has been close on a decade of ongoing achievement. Many of you have been with us for the majority of our existence and our continued success is all down to you. After all, you are the reason we are still in business. We appreciate your ongoing support and we look forward to continuing to work with you for many years to come. At the same time, we are also going to be acquiring new clients in 2012, and we are excited to be able to build the same kind of strong, ongoing relationships with them as we already have with you. Let 2012 be an exciting and successful year for us all.